We're glad Dylan found a good home! This piece is a first for me, in that it combines elements from two previous 512 stories: futurismic police detectives Jake and Andy, who first appeared in "The Forty," and the alien race known as the Varna'ut, from "Universal Language." (It's not fanfic if you wrote the source material yourself, right?) And yes, there's definitely more story here. I'm working on it. In which we once again demonstrate our total unprofessionalism. That's a word, right? 07:58 - ...we can talk about when it's reasonable to leave a note to tell people where you've gone. 10:30 - is this related to Game safety and physical challenges? sure! 16:23 - We're not going to talk about mine shafts. Tye and Dylan have been playing through the gap under the bathroom door ever since we brought Dylan home. They usually bat a paper ball or toy mouse back and forth. ...but no, actually, it was toilet paper. Despite his innocent looks, I'm pretty sure I know who the culprit was. 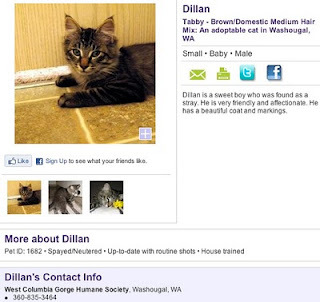 We'll be dropping Dylan off with WCGHS at the PetSmart Nationl Adoption Event in Vancouver, WA this coming weekend. They tell us there's already a family interested in adopting him, which is great! Many movies, including but not limited to Midnight Madness, have inspired puzzle hunts. Do any of this year's Best Picture nominees have Game theme potential? 19:40 - The Kids Are All Right? 24:38 - The King's Speech? 30:27 - The Social Network? 32:50 - Toy Story 3? 50:27 - upcoming events: Puzzled Pint (PDX, 2/8); GC Summit (bay area, 2/12); Chinese New Year Treasure Hunt (SF, 2/19); Iron Puzzler (bay area, 2/26-27).